This fabric line has been discontinued. 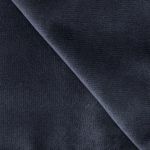 Please see "Related Items" below for our 15.5 ounce Velour alternative. Our 14 oz. Velour drapes are a preferred choice for upscale events! Our 14 oz. Velour drape is Inherently Flame Retardant (IFR) and passes the NFPA 701 fire code. Each drape measures 118 inches tall x 52 inches wide. Edges are serged. The drape is sewn 2 inches shorter than 10 feet tall to avoid pooling on the floor when used at a 10 foot height. Custom heights are available upon request. Quantity 1 = 1 drape. We recommend a minimum of three drapes per 10 foot wide span (for approx. 33% fullness). Approximately 90% opaque (light blocking). While you cannot see objects on the other side of the drape, a series of very tiny pin holes may be revealed when backlit.